If I connect to a RSS feed or use one as a channel source all links go inoperable on that channel - or if I add that RSS feed as a connection to another channel - then on that other channel also no link does work anymore. I tried that in different browsers to rule out a browser problem. Any more information I can provide to sort this out? If I remove that line the links work again. Stefan, I tried, but unfortunately I can't reproduce the problem.... the line you quoted should be called only when videos are embedded and display the red "play" button, but I understand that it's apparently messing around with rss/channel feeds where no videos are concerned. Would you have a post for me to look at or a channel or rss source to connect to? I did set the channel source to an Adafruit rss feed. However, since I removed the line there should be no problem atm. When I looked into the code in developer tools, the last part of the bg-image css seemed to be faulty, but I could not find any bug in the code at first glance. Hubzilla on IE / Windows 8 is broken? I just got information that Hubzilla is obviously unusable on Windows 8.x with IE. More info are currently not available. I became aware of this when I sent a friend the post I am going to link below. He gets an empty page and did not know what to do. He clicked on 2018 from the archive menu and got linked to my articles. Interestingly I can reproduce this on Linux with Konqueror 4.14.25 on the current Debian 9. I am not able to look over his shoulder, unfortunately. Plus I do not have access to any Windows 8. Or we decide not to support that. Does anyone of you have such a system at hand and can have a look? 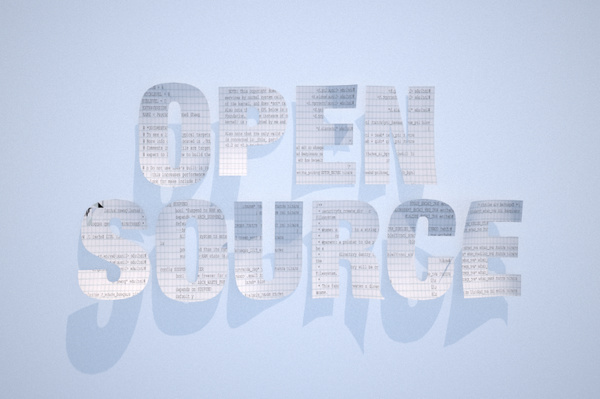 has got a free plan for open source projects. The sourcecode needs to be published on githup or similar and we need to link their logo on our website. Then we can apply for a free plan. Would that be interesting? Maybe we should discuss whether we want to adress this or not. EDIT: hubzilla actually never supported IE. Left column, under your avatar and your bio, the "Archives" links for 2019, 2018, 2017 -- pretty much all items clickable on the whole page (in this status), everything else is blank white. If I remember it correctly, IE 11 sometimes shows a bar at the bottom of the program window which asks for some "Special elements or functions active for this site - Yes/No" decision. It's quite unobtrusive and likely to oversee due to a white background with thin yellow borders. Triple check: Edge (is not IE, I know) works just fine (no add-ons running there). I'm not logged into Hubzilla in this browser, so the public permalink isn't broken either. trying to support everything that _might_ be running somewhere is a bottomless pit. requiring a decent webbriowser isn't asking too much. and somebody who is not able to install anything but IE 8 will not be able to use Hz anyway. @phani (Hubzilla) Don't say that, my mother has learned to communicate with us via HZ but cannot maintain her system. @Waitman Gobble Sure. If I was his admin and a bit nearer than just a few 100k and we were close friends ... ;) but overall I agree. I was dismayed myself. IE doesn't like the default value in the function argument? MAYBE this has been an issue at quite a few times I had tried to get remote relatives into my family hub! Suddenly this may explain a lot. i'm not really happy with redbasic's dark theme, but my taste or preferences are not something everybody needs, so i created a separate dark theme and, because i actually like it, shared it on framagit. it comes with two schemes of it's own: dark and multicolumn. dark limits the main content width to 700px which i find more convenient on today's wide-screen monitors. it doesn't only change the display width, which could be done via redbasic's theme settings, it centers the content in the page and changes dark's colors to provide optical differentiation between posts and comments. multicolumn shows main content in two columns, but only when showing /network or /pubstream. posts on the channel's home page or after clicking on a notification are shown in single column view, just as with dark. to increase screen real estate the right sidebar is shown before the left one, both on the left side, and the right bar's space used for the main content. since i don't want to hide the comments behind a link, all post & comment units have a different height, which, depending on the number and size of comments and your max. height for content, leads to waste of screen space and awkward looking page stretches. eventually i may come up with a workaround, like hidden comments that pop up on mouse-over, but for now i prefer this two-column view to the standard one. it works for both, Hz master & dev. installation instructions are in the README.md file. this makes no difference if you want to install the theme now; you'll always get the latest version. @phani (Hubzilla) , that took me a few minutes to realize that you must have confused github & framagit... (also in your readme.md file. Don't worry... that happened to me before as well... So many gits out there! should do the job just fine! and that's what i wrote, also in the README.md. framagit as well as github use gitlab, which is a software, not a service. what exactly am i confused about? now, whatever you're going to edit in the my_userlogomenu.tpl will show up in your menu! Blue Herbert Thielen Oliver A. It is not well documented (I've posted about it a few times though so it should be able to be tracked down). This allows persistent changes to the UI without messing up the ability to pull updates. redbasic's dark schema has been neglected for a while, resulting in some text items and category badges becoming unreadable. categoies were simple to fix, but the [hl] tag (hightlighted text) is more tricky. this works fine for the non-dark schemas but isn't readable on dark background. the background color can't be changed via CSS rules so i had to change the text color of the highlighted text. this was only possible via a pseudo class that works so far but might lead to unwanted results, affecting other text between <span> tags. the above fixes have been merged into both dev and master and are already active in the latest stable release, 3.8.7.
but at present there is another problem with the dark schema, some text being rendered in dark blue on dark background. with HTML elements being what they are now, this can only be solved by a compromise: make highlighted text less, but that dark blue text better readable. in the wiki mentioned at the end i'm linking to a hack that you can use if you want to use the dark theme now. my idea is to change the BBcode editor to not insert inline styles but CSS classes to change the background color. then background and text color can easily be changed via simple CSS rules in dark and other schemas. i've looked at include/bbcode.php and this could easily be done. additional CSS rules would have to be added to default and dark.css, which isn't a problem either. in the same way other HTML elements could be dealt with, when or if that becomes necessary. before submitting a merge request for this i want to know what the developers think about this idea. since i'm not always very attentive and not using all of hubzilla's features, it's quite possible that i won't notice some problems with the dark theme. i've published a wiki therefore where other users of that theme can tell me what's wrong, or what can be improved: RedbasicDarkWiki. all of my contacts should have write access to this wiki. i want to base new themes on #Redbasic since that is kept in sync with hubzilla development. but it's not in a separate repo, which makes things a little difficult. either keep copying changes to my own theme repo as they happen -- which is a pain of course -- or fork the whole repo just for this purpose, which would tons of unnecessary stuff along. i found this stack exchenge post which offers a solution that seems clean and efficient. haven't tried it yet but will today. Apologies, I am very new to Git and GitHub, I've read through a few things but I'm not sure if what I'm trying to do is entirely possible. i'll let you know in the comments how it goes. I have reasons for wanting to do this for other things - so I'll be interested in seeing how things go. Thanks for the pointer! ok, have been running in some circles so far. reason is that my git-fu is pretty rusty. most of the time i'm using Git for simple backup jobs, like dumping the DBs into a folder and then taking snapshots of the file tree incl. the DB folder. i know where to find everything but not using it regularly, that makes things like git subtree always a bit of an adventure. in short, i managed to mess up my main hubzilla instance because i tried to use a shortcut from the process the article described. i used the fork of hubzilla core that runs my main instance to create the subtree from. not a good idea. will take a little longer, managed to confuse myself. git commands are running wild in my head, need to switch off for a while. if you get this working @M. Dent, please let me know. got around to doing it finally. sticking strictly to the stackexchange article there is no problem. then checkout -b master to get a new master branch which i pushed to a new framagit project from which i can fork any new themes that maintain a connection to the original redbasic. not to merge changes back into redbasic but to keep up-to-date with changes that happen there. it works, but i'm wondering if it's really worth the effort, at least for themes. Git-cloning around corners, pushing & pulling from and to different branches, removing artefacts that made it through the 'subtree split' for reasons i don't yet understand, then 'reset --hard' to get back to a version that can pull from upstream...would be much simpler to just copy & paste the stuff. at least that's what i think now. BUGFIX! Please update the BlueBasic theme! Thanks to @M. Dent who detected & reported the issue, we've just had a bug fixed on the theme which has only been been triggered by the recent #Hubzilla 3.8.6 update. It's not the update which has been the problem, but a bug in the notification template wich has been part of the theme. So the buggy file has been removed and we're back to regular business! Please update your theme, if you are running #BlueBasic on Hubzilla 3.8.6! If you're running the Bluebasic theme on your hub, you might want to give it another pull. Multiple CSS styles have been touched and some more (back-)page templates have seen changes. If the theme is not (yet) available on your hub, tell your admin! I put together a schema for Zot.Social that removes much of the padding in the widgets and reduces the font size a bit for the sidebars. The only problem I'm having is that I can't change the sizes of the badges - as it appears to be set by bootstrap and is set as !important. So I'm not sure the theme can fix it. Have you played with that at all? @M. Dent, can you telll me the css class which makes the trouble? I'm on the phone right now and can't get to it myself... but I'm sure I can work with that. There may be several. I'm in my phone also, so when I sit down in a large screen workspace again, I'll try to take a look. Yup. Looks like the class is "badge" that controls size and padding. Here you go... replace the original files in the css & schema folders with the attached. I moved the badge from the theme css to the schemes. That should solve it for your own scheme as well. If you want to style the badge in your scheme, just copy the badge style over from one of my schemes and you're set to fiddle. I will push them to the git when I'm home! Der Dank gilt ganz @h.ear.t | tobias! 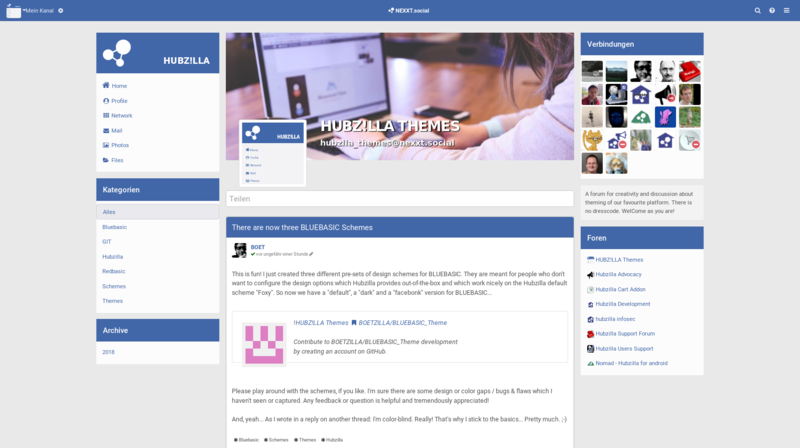 !HUBZ!LLA Themes : This week's update of the #Bluebasic theme is rather unspectacular, but it will provide you with a thoroughly refreshed back-end to your #Hubzilla in the Channel/Hub administration pages. Any feedback is really welcome! UPDATE: I accidentally deleted this post a few minutes ago... Apologies - especially to @Max Kostikov who's comments got lost by that! The point he made was very valid: The usermenu doesn't translate yet, because the code is not yet prepared for browser-localisation. I need to find out how to do that. Looks like rocket science to me - and any help would be extremely appreciated! Just installed in on one channel, looks quite promising! Only I'm missing the bookmarks now which I had included on the channel home. Is there another way to make it visible? Ok, just found it. The displayed menu seems to get reset when you switch the layout. Do you use the Hubzilla PDL editor? I've been using customized page-layouts in my Hubzilla theme(s). But I really wonder, how much people use the native Hubzilla page editor at /pdledit to really make the channel "their own" by moving things around. To use the templates which come with the (my) theme(s), one would have to "reset" a previously customized page-layout (or go for the copy & paste route) to only include/replace parts of it. Hwo do I know what widgets etc. are available? And how to use them? But I got your point... a comprehensive documentation and how-to might be very helpful! Anyone want's to take that? I did take a look, found too complicated, even for a code trainee. But I'll go back there and try to move my Categories from left to right. as @J P Sousa Paula wrote: installed the app, looked at it, and filed it away for later use. at the moment i'm still busy figuring out in which ways i'll be using hubzilla, exactly. after that i'll get to adjusting the deteails. You are absolutely right, @J P Sousa Paula! A drag&drop interface like it comes with the standard wordpress widgets is already a lot to handle for an average blogger - but still a world ahead from the Hubzilla way doing it. But building something like that is not done in a day. That's the main reason, I included some pre-widgetized page-layouts in the theme(s) - to suggest and offer a setup to the user, instead of asking her/him going into the code... I might do a couple more. OK. I moved my categories widget from the left to the right. I can reset it. But I want to save a... redbasic scheme/theme, but really red. How? I mean I still have to know how to change colours but what I want is having my themes, like the bluebasic. i don't know if there is a stub theme somewhere that contains all necessary files with basic settings. that would be a good starting point for creating your own theme. i've thought about this too but didn't see the need yet. if i wanted to create my own theme i'd make a copy of bluebasic, then change "bluebasic" in file names and wherever that name is called inside, to my new theme's name. assuming i didn't mess up anything, forget a mention somewhere or mess up PHP or CSS code, this would be my new theme. placed into the view/theme/ folder it should be available in settings --> display, with whatever changes i made to colors, etc. Brilliant, @phani (Hubzilla)! What you describe is exactly what I did. Though I would recommend starting with redbasic, just because it is the default and the only one which receives regular updates as being shipped with the "master" branch. And then, it doesn't even have to be a full theme! As most customization can be done and applied in a local scheme. Because that's the CSS which get's loaded last and so can override any previously loaded styles. That would allow to keep Redbasic as the (updated) code-base for your theme, while your styles live in the seperate scheme. It gives you full color customization and some more configurable options which go so deep and far across the appearance of your theme, if you don't want to go in on the (css)code level, it seems to be the most feasible way forward for the average user. But note that you will need to use a scheme which doesn't contains color styles (like the default "Focus" scheme). yes, i have been playing with the custom style options and also the PDL editor by now. funny thing: placing blocks or widgets into right_aside with the PDL editor has no effect with the redbasic theme enabled, but works with bluebasic. to get into these trickier things it's probably better to create a new theme and play around with all the options without messing up the existing themes. i've looked into the code already and it's not rocket science, but not on my immediate to-do list. another option to create a different looking home or stream page would be to create a webpage, which also has access to the page elements and can define it's own CSS & JS. i'm not sure yet which approach i'll take if or rather when the time comes. i might wait for hubzilla 4.0 to come out since things will change, and i want to see if federation with diaspora still works. I just finished work for the day. Plenty of small and some dirty fixes to the theme have been send to the git just a little while ago. If you make a fresh pull, you are going to be fine for the next couple of days. I'll be hitting the road to the UK and won't be back before the next weekend. Until then: You are on your own! Any feedback is tremendously & fullheartedly appreciated! There are so many places in this to look, you can get lost. So help in testing is a major way to improve this little piece of work! Please make screenshots when you find something and reply under this post. PS: If you are an admin & brave & curious enough: There's also a little hack repo on my github. DON'T clone that git to your hub, but download and put the files manualy into the right places (Instructions are in the "Read me"!). I really need to get that into an improvement request for the core at sometime... because I just love what it does! Alright, this is *different* to my earlier post! Since here, we have a full & stand-alone theme. It gives you basically the same layout & structure as the earlier Redbasic/Bluebasic scheme, but it works on it's own - without a scheme. This theme can now be activated through the admin/themes/ and also made a default theme for your hub - when it's been cloned to your theme directory via git or ftp..
shouldn't this be added like the other addon repos, with util/add_addon_repo <git URL> ? Give it a try and tell us how it went! That would be great! util/add_theme_repo [git URL] [nickname] is. edit: forgot the nickname at first. Works very well, thank you @boet ! i have been using the dark version and that isn't really good. icons disappear on mouseover, per example. also text & background aren't always readable. will try the other options now. My apologies @phanisvara das, I didn't test all the schemes. My bad! Really! I'll try to come up with a "dark" version asap. But probably not today anymore. Until then, maybe any other of the schemes would work as an intermediate? works great with the first option (hubzilla default, whatever it's called), and probably the others as well. if you get around to play with the dark option, IMO the default theme's dark is too dark, too black. a bit heavy on the eyes. could be a few shades lighter. that would probably deal with readability as well. and i really like this theme; gonna keep it. great work! AWESOMENESS ABOUNDS! Thanks @BOET !!! Also will be great to use t() function to support interface elements translation to other languages. Thanks @Alex! I will certainly do so! I've never been using /events, so this is a good reason to get that started! But, please, don't hold your breath...: I'm color-blind! Really! @phanisvara das I checked your channel... looks good to me!!! Thanks so much for trying! Have you thought about playing with the custom theme settings? You can really get a whole different experience out of it. Just as an example - one minor change: Under "Set the background colour" put something like: "#e9e9e9"
if i get bored some time i will play around some. btw, i'm noticing something weird when inserting smileys now, as if they all float to the left. don't remember seeing this earlier. that perhaps your theme's fault? Good catch! @phanisvara das Thank you!! Not weird at all. Just dirty css. I missed emojis, because I HATE them - and so I turned them off on my hub. But I fixed it on the git! hm, i see that you uploaded new versions of your global style.css and ~.css & ~.php of the BS-default style, but those smileys still float to the left, even after clearing out store/[data]/smarty3/[compiled]/* and refreshing my browser's cache. as far as i'm concerned, take your time. these are things i can live with. just mentioning them here so you can straighten them up eventually. 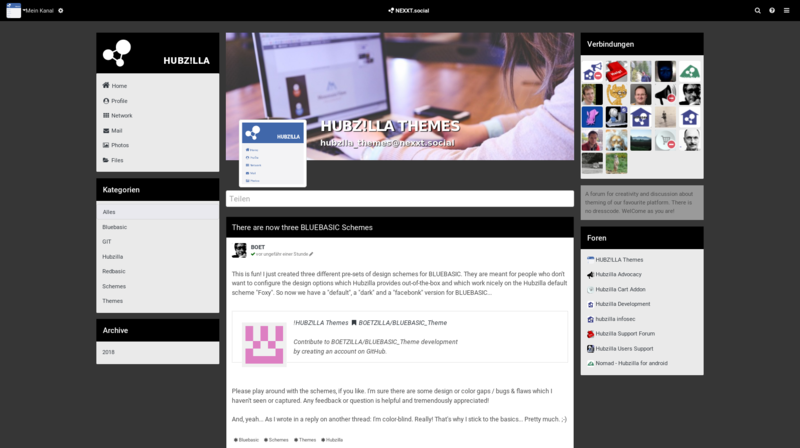 The @HUBZ!LLA Themes Forum now has a clone on Zot.Social. @BOET Recommendation: use git from command line. A forum for creativity and discussion about theming of our favourite platform. All Creatures Welcome! No dresscode. Come as you are!